This four-holed box for Tree Swallows was designed by Henry E. Kinney of Massachusetts, and shown on page 70 of John K. Terres' book "Songbirds in Your Garden" (1953 - updated in 1968), but originally appeared in the Bulletin of the Massachusetts Audubon Society, March 1952. Jeremy Berger of Montgomery, IL modified the plans for standard wood (the plans don't show the ventilation holes he added.) Download Berger plans in PDF format. This YouTube video shows assembly. Terres says that the box was designed to "protect young tree swallows from starving and from exposure during spells of rainy and cold spring weather, when they need considerable insect food, which might be difficult for parents to find." 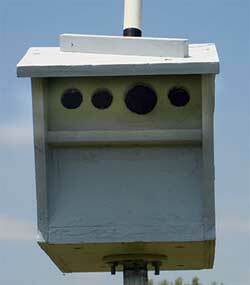 (See info on Tree Swallows found dead in nestboxes.) It has four holes - one that is 1.5" (for adults) and three 1" feeding holes which allow adults to feed young faster without entering the box. (Some use a 3/4" hole for the smaller ones.) This would also help address the tendency to "hole hog" exhibited by older nestlings. 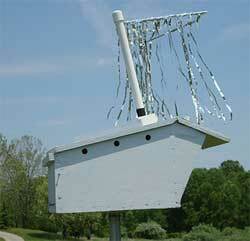 Kinney found that more nestlings survived in this design, and more adults returned to nest in them in the spring than in a single-holed box. C or front roof is 6.75" (including the angle cut) X 8.25"
D or main roof is 8.25" X 12.25"
Sides you would need to lay out once you get your other parts cut out. See photos on right of a box made by F. Lovelett. She added ventilation holes on the sides. She said she would also increase the side and rear overhangs, and removed the porch. She finds it difficult to monitor via the rear, and has to use an automtive inspection mirror since the Tree Swallows built their nest way up in front. She has added a sparrow spooker.